Zambian water authorities are integrating information based on satellite imagery to alleviate water shortages. With inadequate information causing many water-related problems, an ESA project has generated a variety of environmental maps to provide local policy makers with the necessary tools for effective water resource management. 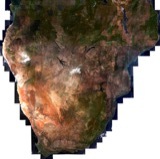 As part of the IWAREMA (Integrated Water Resource management for Zambia) project, funded through ESAâ€™s Data User Element, data from ESAâ€™s multispectral MERIS sensor aboard Envisat was used to create maps depicting existing water resources, suitable dam locations and land cover. The project is carried out by the Belgium Company GIM (Geographic Information Management) in partnership with the University of Zambia and the Zambian water authorities. "The results of the IWAREMA project can be used to protect Zambiaâ€™s ecosystems particularly in the Kafue flats where wildlife, agricultural activities, fisheries and tourism compete for regulated water resources," Jack Nkhoma of Zambiaâ€™s Department of Water Affairs said. Having access to these maps allows authorities to determine the expansion of urban areas and loss of forest and agricultural areas as well as calculate the risk of erosion, change in water availability and percentage of surface water, which will allow for early flood warnings. The land cover change maps will help the government look at past trends in terms of deforestation, reclaimed land and new settlement areas to determine the long term affect and implement corrective measures. Zambia has one of the highest urban populations in Sub-Saharan Africa, with about 34 percent of the total country population of nearly 11 million people living in urban areas, according to the United Nations Human Settlement Programme. The rate of urbanisation has been unprecedented and has therefore exceeded the rate of infrastructure development and service provision, such as water supply and sanitation. "With a lot of pressure from population growth and urbanisation, the land cover maps will show how demographic variables and pressures will impact natural resources," Nkhoma said. The project focused on the Kafue River Basin, which is a sub-basin of the Zambezi River. The Kafue Basin is of great importance to the countryâ€™s economy and is home to more than half of the countryâ€™s population. "The IWAREMA project information is useful for our policy makers in decision making for the basin and should be extended to other basins of the Zambezi so as to improve the data situation and make comparisons between areas, as very little information is currently available," Banda Kawawa of the University of Zambia said. "The products have also shown to be cost effective in relation to other conventional methods used." 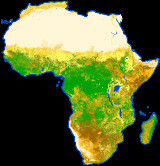 IWAREMA was one of the projects initiated under ESAâ€™s TIGER initiative, launched in 2002 to assist African countries to overcome water-related problems and to bridge Africa's water information gap using satellite data. To date, more than 100 African water basin authorities, universities and other organisations have become involved in TIGER projects across the continent.